A jigsaw puzzle is a picture, which is adhered to a thin and stiff background, like wood or cardboard, and then cut into multiple pieces. The pieces are assembled by the user to reform the original picture. Although the origin of the word puzzle is unknown, it is known that the first jigsaw puzzles were made in the 1760s by European cartographer John Spilbury. In 1762, Spilbury hit upon the idea of gluing maps onto thin mahogany and cedar panels and cutting them up with a fine marquetry saw. He marketed the results of efforts and they became quite popular. Before his death in 1749, Spilbury sold hundreds of puzzles. In the mid-1780s, the next generation of puzzle makers expanded their craft to reach consumers who were not interested in maps. They made puzzles from broadsheets, tabloid size magazines printed with humorous poems or stories. However, broadsheet puzzles were not profitable because their subject material quickly became outdated and new ones had to be printed. Nonetheless, broadsheet puzzles proved that there was a market for puzzles other than maps. Puzzle makers experimented with new images including the alphabet and multiplication tables, Biblical passages, and pictures of historical events and people. Puzzle popularity increased in England during the following decades, and there is evidence that puzzles arrived in the New World sometime before 1800. Around the same time, the process of color lithography was developed which allowed better quality pictures to be produced more efficiently. This improved the quality and variety of puzzles; some clever manufacturers even made double puzzles with a different scene on each side. In the 1860s, puzzle sales continued to boom as two major companies flooded the market with a variety of puzzle types. These key players were Milton Bradley and the McLoughin Brothers. The 1890s saw the development of die cutting methods, which eliminated the need to cut puzzle pieces by hand. This process allowed puzzles to be mass produced and made them much cheaper. The next few years brought two more significant innovations. First, Parker Brothers, another famous game manufacturer, introduced custom shaped figure pieces into its Pastime brand puzzles. These figure pieces where shaped like recognizable objects, such as dogs or birds. The second innovation was the development of irregular, interlocking pieces. The interlocking format became the standard design because they held the puzzle together and reduced chances that the puzzle would be disturbed during assembly. Although puzzle sales flagged somewhat in the early 1900s, by the late 1920s and the onset of the Great Depression, there was resurgence in popularity. In 1933, sales peaked at an astounding 10 million per week. With lack of steady employment, people turned to puzzles and other forms of home entertainment instead of outside entertainment like restaurants and nightclubs. Many unemployed architects, carpenters, and other craftsmen made their own jigsaw puzzles for sale or rent. As the puzzle craze of the 1930s continued, drugstores and circulating libraries offered puzzles for rent; they charged 3-10 cents per day depending on the size of the puzzle. For a brief time in 1932, retail stores offered free puzzles with the purchase of toothbrushes, flashlights, and hundreds of other products. By the time World War II ended in the late 1940s, the sales of wooden jigsaw puzzles went into a sharp decline. This was because rising wages increased the labor costs of hand cutting the pieces. 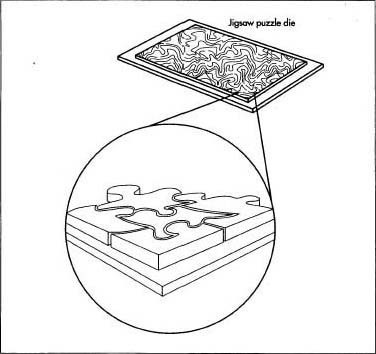 At the same time, improvements in the lithography and die cutting (processes which had been introduced decades earlier) made the cardboard puzzles more attractive. The Springbok Company, one major manufacturer, began making puzzles based on high quality reproductions of fine works of art. Hundreds of thousands of Americans struggled to assemble Jackson Pollock's "Convergence," when Springbok introduced it in 1965. By the late 1960s, wooden puzzles had practically vanished. However in the mid-1970s, Stave Puzzles was founded on the belief that there was still an audience for high quality wooden puzzles. Their success has proven them correct, and in the last 25 years, a number of small custom wooden puzzle manufactures have helped re-popularize wooden puzzles. Virtually any artwork can be used for puzzle making but most major manufactures use lithographic prints because they are high quality, inexpensive, and easily mass produced. Many of the pictures used in puzzles are based on famous photographs or paintings, but some custom puzzle makers let the customer supply their own photographs or pictures. Mass market puzzle manufacturers use card-board (also known as chipboard) as a backing material because it is cheap and easy to cut. Higher quality custom-made puzzles still use wood, usually in 5-ply birch. In both cases, adhesive is used to bond the artwork to the backing material. The original wood puzzles were cut with jigsaws, also known as scroll saws, and customized wooden puzzles are still made that way today. These saws have a vertical blade that goes up and down through a fixed horizontal table. The puzzle sheet is guided through the blade by hand to cut the desired pieces. The blades used today are very fine, about 0.016 in (0.041 cm) thick. This allows intricate cuts to be made, which take out very little wood, so the puzzles fit together well. It also leaves a very smooth edge surface, with only a minimum of chipping and fuzzing on the back, which can be sanded off. The majority of puzzles today, however, are the cardboard-backed types and these are mass-produced with die cutting equipment. Puzzle design varies depending on the type of artwork and the style of puzzle desired. The design of the cuts is hand drawn by artists and, consequently, no two puzzles are alike. Quality puzzles are designed to artfully combine the picture with the design of the cut pieces to enhance the enjoyment of the user. Puzzle artists are cautious in their design not to cut through major features of the artwork such as a person's face. The artists control the puzzle's skill level by varying the number of pieces and the complexity of the cuts. Typically, the more pieces the puzzle is cut into, the more difficult it is to assemble. Some puzzle makers make their puzzles even harder to assemble by avoiding straight-edged border pieces. The lack of a straight border makes the edge pieces harder to locate. Nearly 2,000 hours are required to produce a puzzle from start to finish. This process typically stretches over about 12 months. The key steps include printing and laminating the artwork, cutting the pieces, and packaging the finished puzzle. Puzzle pieces are mass produced in a process known as die cutting. A die cutting press uses a sharp, flat metal ribbon to stamp out the individual pieces. The artists drawings of the cuts are sent to rule-bend experts who bend razor sharp steel rules into the shape of the puzzle pieces. The metal rules are then pounded into a wood mounted die. One side of this metal ribbon is fixed in a wooden block. When this block is pressed with sufficient force onto the softer cardboard backing, the backing surface is cut into the desired shape. water while the printable portions are coated with grease, which attracts the oil-based ink. When ink is applied to the plate, it sticks only to the grease coated image. As the plate is brought into contact with paper, the image is transferred. Many puzzle pictures may be prepared on the same lithography sheet to save paper and minimize press time. After printing, the litho sheets are laminated onto 0.087 in (0.22 cm) thick chipboard. They are allowed to dry for several days before they are sent to die cut press. 2 Puzzle pieces today are mass-produced in a process known as die cutting. A die cutting press uses a sharp, flat metal ribbon to stamp out the individual pieces. The artist's drawings of the cuts are sent to rule-bend experts who bend razor sharp steel rules into the shape of the puzzle pieces. For a 500-piece puzzle of average complexity, it may take 400 hours to make a die. Three or four such dies maybe made for puzzles of the same size and shape. The metal rules are then pounded into a wood mounted die. One side of this metal ribbon is fixed in a wooden block. Whep this block is pressed with sufficient force onto the softer cardboard backing, the backing surface is cut into the desired shape. When the laminated artwork is sent through the die cut press, the die is forced down under high pressure. When the die is extracted, the artwork and underlying cardboard are left with cuts in the shape of die. 3 After leaving the die press, the sheets go through a breaker, which separates the puzzle pieces and drops them into their package, typically a cardboard box. Today, it is standard for the box to feature a picture of the completed puzzle as a guide. Manufacturers began offering this feature in the mid-1930s. These boxes then go through final packaging, shrink wrapping, etc. Finally, they are shipped to retail stores. While the artwork used in puzzles is constantly changing to keep pace with current consumer tastes, there have been few manufacturing innovations in recent years. Nonetheless, there are areas from which future developments are likely to come. As noted above, quality customized wooden puzzles are gaining in popularity. One company, i.C. Ayer & Co. has developed novel computer-controlled water jets to automate the cutting of wooden puzzles. One new type of puzzle takes two-dimensional jigsaw puzzles and transforms them into three-dimensional puzzles. These puzzles feature die cut pieces which, when assembled, form a three dimensional sculpture. This approach is so novel it has been granted a United States patent (U.S. Patent # 5251900). Lastly, jigsaw puzzles of the future may be electronic without either cardboard or wood. These virtual puzzles are constructed by computer, and exist only on monitor screens. Special software allows puzzle aficionados to continue to enjoy the challenge of reassembling the scrambled pictures without the need for a physical construct. De Cristofor, R.J. The Jigsaw/Scroll Saw Book. Blue Ridge, PA: Tab Books, 1990. Sabin, Francene and Louis. The One the Only, the Original Jigsaw Puzzle Book. Chicago: Henry Regnery Company, 1977. Williams, Anne D. Jigsaw Puzzles An Illustrated History and Price Guide. Radnor, PA: Wallace-Homestead Book Company, 1990. 1760s by European cartographer John Spilbury. In 1762, Spilbury hit upon the idea of gluing maps onto thin mahogany and cedar panels and cutting them up with a fine marquetry saw. He marketed the results of efforts and they became quite popular. Before his death in 1749, Spilbury sold hundreds of puzzles.